The opening of the high speed line for Kent domestic services is a fascinating reversal of what usually has happened in this country. Normally such major pieces of infrastructure are only provided once there is a pressing demand but on this occasion, the high speed line has been built and now there is a desperate need to find uses for it. The high speed line project has already left behind a series of expensive white elephants, which have been sold off cheaply or remain unused. There are the five platforms at Waterloo International, the North Pole depot at Willesden, Ashford International (mostly given the paucity of trains, but there are plans to increase them), Stratford International (whose first and possibly only use will be for the Javelin trains at the Olympics), the north of London day trains – thankfully used by other operators – and the hotel trains for sleeper services (sent at rock bottom prices to Canada). At face value, one could say that these various debacles are a result of political interference in the rail market but the story is more complicated than that. It is, in fairness, impossible for governments not to be involved in the decision making process for investment in the railways because much of the funding is always going to come from taxpayers. Certainly, the government is going to continue to interfere. Indeed, the government has taken control of the project and both ministers and High Speed One will be particularly anxious to increase usage of the line. The government has nationalised High Speed One, with the idea of packaging it up into its three components – the line itself, Eurostar UK (which owns a third of the overall Eurostar service, the rest belonging mainly to SNCF and the land property holdings – for eventual sale to the private sector. The £5.2bn debt has gone directly onto the government’s books, which will allow High Speed One to offer cheaper access charges but inevitably it is not that simple because the way we run these projects in the UK, always pretending that they can be done economically and with private involvement, means that they are always complex, lack transparency and generally come out more expensive than if the procurement exercise had been kept simple. So, rather than simply writing off the debt since we know that railway projects bring all kinds of other societal benefits that cannot be paid for through the fare box, High Speed One is supposed to charge access high enough to ensure that over two concession periods – the first stretches to 2047 and the second, probably, will be to 2086 when the Eurotunnel concession ends – the cost of the construction is supposed to be paid back. While that may seem laughable because it always is based on the idea that projects have to pay for themselves in financial terms and money earned in 2086 is virtually worthless today, the result is that the price of using the line will remain comparatively high, something like £4,200 per Eurostar train path. This is made up of an operational cost of around £2,000 to pay for the maintenance and running of the line (the rate is calculated on the number of minutes the service uses the line, so the Kent domestic trains will pay less since they mostly will leave the line at Ebbsfleet), and a further £2,200 for what is called the ‘investment recovery charge’, which is some £3,000 less than previously before the line was nationalised. It is still expensive. Say the Eurostar has 400 people, an average load, that works out at £10 per passenger and then with a further £12 50 which Eurotunnel charges for every passenger going through the tunnel, which means immediate costs of £45 for a return journey before Eurostar makes any money towards its other expenses. Eurostar, whose ownership structure is so complicated that it would take this whole column to explain in detail, does not publish any accounts, merely revenue figures. That is because its other owners, SNCF and SNCB, incorporate many of the costs into other parts of their business and there is no clear analysis of costs. What we do know, however, is that Eurostar UK is loss making partly because of the high access charges. Given this extremely complex and difficult situation, any new operator will face an uphill task to make a business case for running international services, even with the reduced access charges. There are a whole host of other obstacles, noticeably the requirement for trains running through the tunnel to be able to be split in the case of an emergency with all the passengers piling into half the coaches, which is why the Eurostar train sets are the only ones currently certified to operate under the tunnel apart from Le Shuttle stock. The Channel Tunnel Safety Authority is aware that this is a ridiculous requirement and is likely to waive it, but has to tread carefully given that there have been three major fires in the tunnel in its first 15 years of operation, much more than had been predicted in the risk assessment. Then there are the security strictures imposed by the UK government on trains using the tunnel. The huge amount of fencing around existing stations at the ski resorts, Avignon and Disneyland currently used by Eurostar suggests that dedicated platforms will be needed, something which putative operators like Deutsche Bahn will be unwilling to provide since they will be used for only a few services per day. Despite these difficulties, the government and High Speed One are in negotiations with both the French and German state railways to run new services into St Pancras once the open access arrangements for international lines imposed on the government by the European Union come into force next year. So far the line, with at best four trains per hour, has been greatly underused but this will change with the Kent domestic services, which will mean about two thirds of capacity is filled. Freight is another possibility, as charges have been sharply reduced for freight trains, but my bet is that the freight loops provided at great expense will be another white elephant. Overall, with three minute headways, there is scope for 20 train paths per hour but realistically High Speed One, which is responsible for marketing the line, is aiming to fill 16 or 17. 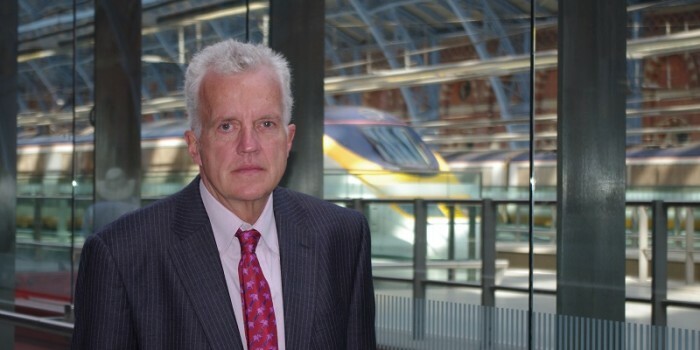 With four Eurostar trains at peak times, and, from December, eight domestic Kent services, that only leaves four or five in the peak, but plenty more off peak. The launch of the Kent services, with an embryonic service being offered now, six months in advance of the full timetable, could not be happening at a worse time. The service was launched with much fanfare and the inevitable press trip on June 15, attended by Lord Adonis who was, of course, very upbeat about the whole thing. However, not only is this a bad time for the railways, but there are serious doubts about whether people will pay the premium fares – up to 35 per cent more than on the old lines – to go to a station, St Pancras, which may well be much further away from their work than Charing Cross or Cannon Street. The outcome of the equation between time savings and extra cost will depend very much on people’s individual circumstances. The marketing people at Southeastern tell me that extensive research, involving 4,000 users and non users of the service, has been undertaken and the results are extremely positive, with many respondents apparently very keen to transfer to the new trains. They would say that, though and they will not reveal details of the research which is, of course, ‘commercially confidential’. Of course, the new services are being subsidised, with extra money from franchise payments, but this is unlikely to be enough to keep Govia, which has the Southeastern franchise, in the black given the change in circumstances from when the franchise was let four years ago. I always argued that this was an unquantifiable risk that should never have been passed on to the private sector and from the sour comment quoted above, it suggests that Southeastern – or its parent company – is rather regretting having taken it on. Indeed, a senior source at Govia told me that they would have preferred that the money invested on high speed services had been spent on refurbishing existing heavily used stations such as East Croydon and generally improving the routine train service. My view is that in the long term, provided that fares rises are eventually restricted to inflation or below, the line will stimulate development at both ends, Kent and the King’s Cross lands, and the trains will eventually fill up. But in between, for the next ten or even twenty years, I suspect there will be precious few full trains. High Speed One, therefore, is a fascinating experiment being largely conducted at our expense. Its users are being subsidised in various ways, both openly and indirectly. At the moment it is being greatly underused but that will change as the Kent trains are introduced and, possibly, other international services will emerge. Of course it is very exciting and has given us a fantastic new railway and a world class station. However, it is too early to say whether the vast sums that have gone into its construction, which realistically amount to nearer than £10bn than £5bn if the various extras (remember the Eurostar trains worth a £1bn or so which were given away and the improvements paid for by British Rail) are taken into account have been well spent. That will depend on how flexible the government is prepared to be over potential future users and whether the Kent trains are really a regenerative factor or yet another part of this saga that turn out to be a white elephant.